By Patrick Straub, GRG owner. Just like spring runoff, getting old is inevitable. My eyes don’t see well enough to thread 6X tippet on a size-18 fly. My Achilles’ are hungover after a day of walking and wading the Gallatin River. And, depending on what I have for breakfast, I never fish too far from a bathroom anymore. My wife and I purchased Gallatin River Guides from the French family several years ago, because I was getting too old to guide 150 days a year. And the heaviest dose of reality came the other day in the fly shop, when two younger male anglers were standing at the fly bins. PMDs and caddis were thick on the river that day, and they asked what flies they should use. I pointed out a size-14 Parachute Purple Haze and size 14 Parachute Caddis. Fly fishing has plenty of opportunities for complexity—sight-fishing nymphs to feeding trout in a clear and shallow spring creek; stalking a bonefish or permit; or knowing just when to set the hook when a steelhead finally hits your swung fly. But when our local rivers are in prime shape and hatches are thick, embrace simplicity and fish a single dry fly, when it really does make sense to fish single dry flies. Here’s some help. Commit to it. Choosing to fish just one fly is a leap of faith on several levels. Trust your instincts, have faith in your fly selection, and set yourself up for success by fishing at times and on rivers that are favorable to single dry fly opportunities. If you’re unsure, ask your local fly shop where your single dry fly stands a chance. The Gallatin, some smaller creeks, Slough Creek in Yellowstone National Park, and the Yellowstone River, both in the park and outside its boundaries, are all good options. Know your hatches. Don’t stress out because you can’t tell if the bugs you see hatching are Ephemerella infrequens or Brachycentrus americanus—if you want to geek out on entomology, hang out on Instagram more than actually going fishing. However, you must understand that mayflies and caddis hatch in abundance in mid-summer. Pale Morning Duns, or PMDs, emerge from hatching nymphs and, once hatched, appear like tiny sailboats floating on the water’s surface. Caddis, a moth-like insect, flutter in the air and rarely float along the water, instead they bounce on the water’s surface as they lay eggs. 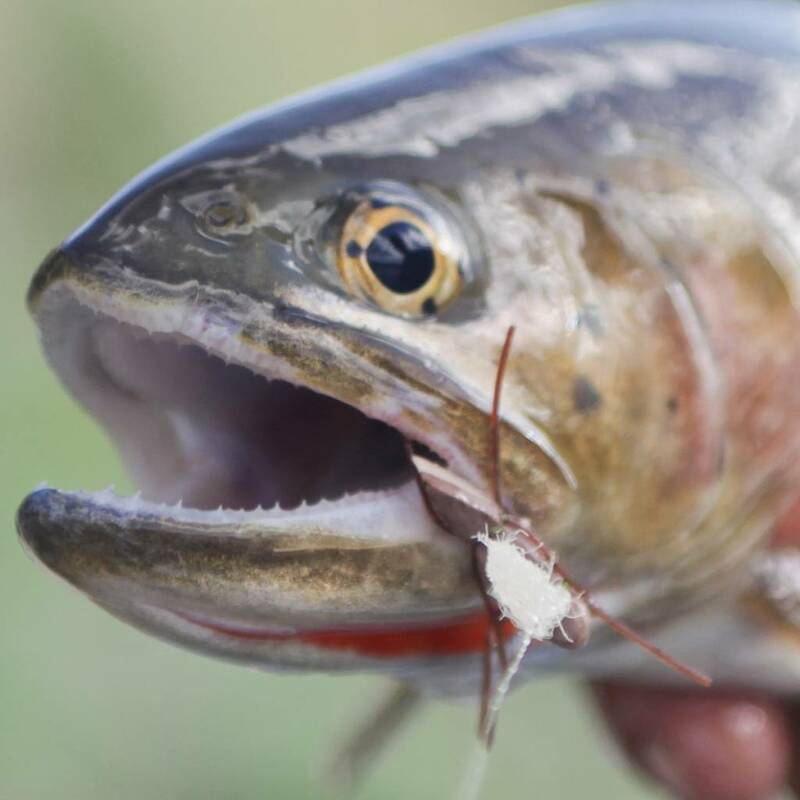 Trout will eat PMDs and caddis off the surface regularly, which means your well-presented dry fly stands a good chance of being eaten. Adjust your tackle. Fish a longer leader and lighter tippet than normal. If you choose to go with a single dry fly, fish a leader at least 9-feet long, tapered to nothing lighter than 4X. My preferred single dry-fly leader for the Gallatin River’s PMD and caddis hatches is Rio Suppleflex 13.5-foot 4X leader. If you don’t want to purchase a specific leader, be sure you’re armed with spools of supple monofilament in 4X through 6X. Invest in a variety of fly floatants and drying powders, and be sure to have each with you on the river. Some fly floatants work well with some materials, while others don’t. For example, Loon’s Aquel doesn’t work well with CDC material, but High N Dry does. Embrace the mend. A proper drift is crucial to single dry-fly angling. Most often a drag-free drift—where the fly floats naturally along the surface without being pulled along by the fly line—is accomplished by mending throughout the fly’s drift. Understand when to mend, how much to mend and learn a reach cast. A simple adjustment I often tell anglers fishing with me is that prior to mending, raise the rod handle high above your head, thus raising the entire rod, and then begin mending. This simple adjustment allows for an easier mend of more fly line. As the two kids were checking out, I thought about charging them double because they were expecting to purchase twice the number of flies when they entered the shop. But of course, I didn’t. And, they probably wouldn’t have noticed because their phones kept pinging from some message they had posted. Life is complicated enough—if you can fish just one fly, do it—you might enjoy what some of us have known for a long time.